It takes a certain kind of tourist to sign away their life and board a bus to the site of the world's worst nuclear disaster. April 26, 2012 marks 26 years since the devastating explosion at Ukraine's Chernobyl power plant. Within the past year, small groups of extreme tourists make the macabre pilgrimage to the crippled plant and surrounding radioactive zone. Liability wavers, radiation detectors and disturbing images are par for the course. 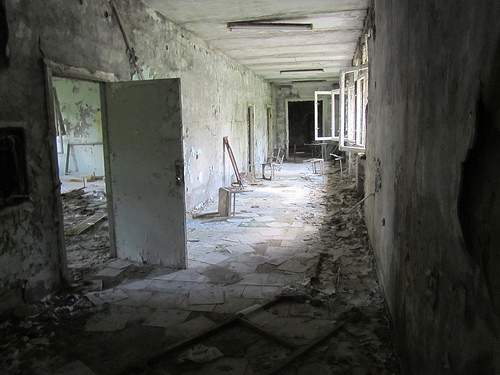 This is the unsettling reality of spending a day at Chernobyl. We pull up to the eerie security checkpoint at the "Zone of Alienation," the 30-kilometer Exclusion Zone of contaminated land surrounding the power plant. Before we're permitted to proceed, military guards confirm our identity. They give us a once-over; no bare skin allowed around the site's continuously leaking radiation. We sign lengthy wavers. We listen to the rules: no eating, drinking or smoking outdoors. Don't step off the path or touch any vegetation. Cameras and bags must never touch the ground. Back on the bus, we ride in silence. The true "dead zone" is the highly radioactive 10-km area surrounding the plant. Within this area is the abandoned Soviet city, Pripyat. As soon as the plant's foreboding chimneys come into view, the bus fills with the squealing alarms of hand-held Geiger counters. We're in the middle of a hot spot, and I'm beginning to lose my nerve. Reactor 4 is the epicenter of Chernobyl's nuclear explosion, identified by its scaffolding cover and concrete sarcophagus, erected after the explosion to block dangerous particles. Today, the sarcophagus is cracked and unstable, awaiting reconstruction. Our bus pulls into a parking lot for a photo op just 200 meters from Reactor 4 -- way too close for comfort. Geiger counters show levels more than 20 times normal background radiation. Three kilometers from Reactor 4 is post-apocalyptic Pripyat, a nuclear ghost town permanently frozen in time. This was once an ideal Soviet city, home to some 50,000 inhabitants, mainly plant workers and their families. Today trees grow through cracks in the concrete and buildings sag on the verge of collapse. The townspeople of Pripyat were the first to witness the explosion. A shimmering plume of rainbow-colored light shot straight up, lighting the sky for miles. According to our guide, some residents rushed closer to watch the exploding reactor -- unaware of the danger -- later claiming it was the most beautiful thing they'd ever seen. On April 27, 1986, one day after the accident, the entire town of Pripyat was evacuated. The government provided buses for each apartment block and told people to take just a few necessities, calling the evacuation "short-term." Since then, the city has remained uninhabitable and largely untouched. We step gingerly into the brightly painted lobby of Pripyat's main community center. Window glass crunches beneath our feet, breaking the somber silence. A public library is now an empty room carpeted with dust-covered books. In the corner of a gymnasium, a lone climbing rope hangs from soaring rafters. A massive indoor swimming pool sits empty; the water simply evaporated over the years. 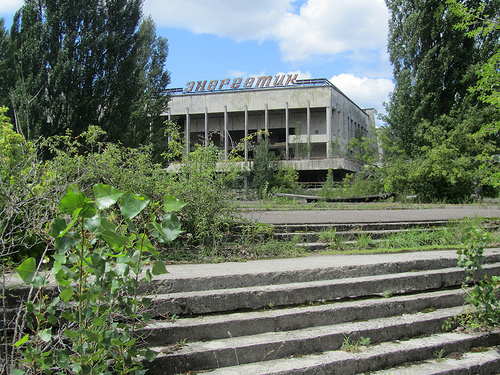 Perhaps the most famous images from Pripyat are from the abandoned amusement park near the city center. A bright yellow Ferris wheel towers above overgrown brush, symbolic of the town's past life. We catch glimpses of apartment buildings buried deep in the woods and the occasional flash of a mailbox. Our final stop in Pripyat is an elementary school. The darkened, rubble-strewn hallways evoke the set of a horror film. Gas masks litter the floors of some classrooms. I stop to examine framed photos and school lessons still hanging on peeling walls. In order to minimize exposure we can only remain a few minutes. We eat lunch inside the Chernobyl power plant cafeteria. They assure us it's safe. In order to enter the premises we must pass through a radiation detectors. We stand with our backs against a machine, feet firmly planted, hands and wrists in front. Each person in our group is scanned; today we all pass the test. Before we leave the 10-km zone, we stop at a railroad bridge adjacent to the power plant. The rust-coated bridge spans a small river, where the main attraction is a school of abnormally large catfish. I step onto the bridge and take a last look at the failed reactor. My final thoughts are with the victims of the Chernobyl disaster. I take a moment of silence and head back to the bus for the long ride home. Chernobyl's Exclusion Zone officially opened to tourists in 2011 but has closed several times in the past year due to lack of government funding. In March 2012, a building collapse in Pripyat limited visitor access. 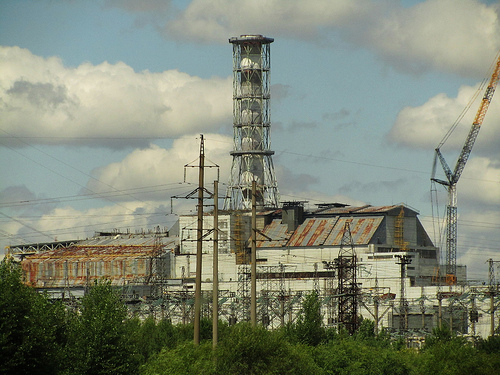 Chernobyl tours are scheduled to resume this week, beginning Friday, April 27. 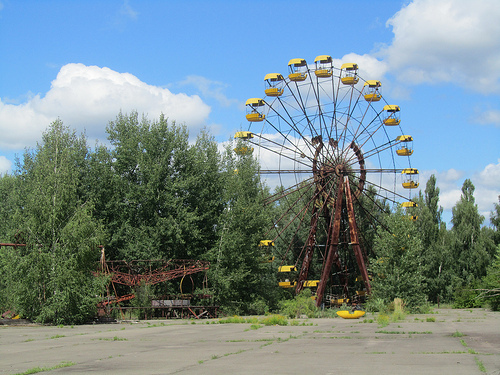 For information on booking a tour to Chernobyl, visit Solo East Travel at http://www.tourkiev.com.